William James Newens was born in Wraysbury on 13 September 1894. He was the third of six children and the first son born to William Newens, a hay-binder, and Alice Jessie Winfield. Little did he know when listening to bible readings in church and at school that he would one day visit the Holy Land himself. It can’t have been easy to support a young family on hay-binder’s income. Although it sounds like it might be seasonal work, hay dealing was a full-time occupation as horses had to be fed all year. Particularly in areas surrounding towns and cities, hay production was a major farming industry and stacks were supplied on a regular basis. Some hay binders were also thatchers. William’s family moved around a lot, perhaps as his father searched for work. His sister Annie was born in Benson, Oxfordshire in 1887. His parents’ marriage was registered in nearby Wallingford in 1890. In the 1891 census, the family was at Checkendon, Oxfordshire; this is where daughter Nellie was born, c1892. William was born in Wraysbury, Buckinghamshire, in 1894; his brother Albert in Skirmett, Oxfordshire c1897. Two more brothers were then born in Wraysbury, Robert c1902 and Henry c1904. At the time of the 1901 census, the family was living at Welley Road Cottages, “number 2 from Datchet” in Wraysbury, but they didn’t always get on with their neighbours. In September 1901, the Slough Windsor & Eton Observer reported that William’s sister, Annie, was washing at the shared pump outside when a neighbour, Mary Lovejoy, threw water over her, yelling ‘Someone else will pay you out in the end if I didn’t’. Annie shouted for her mother, Alice, and Mary threw water over her too, then hit her on the head with the water jug, knocking her out. It emerged that this wasn’t the first time the women had quarrelled. Mary was charged with committing grievous bodily harm and given the choice either to pay a fine of 21 shillings or spend 21 days in prison. By 1910, the Newens were in Datchet but the Slough Eton & Windsor Observer reported on 15 January 1910, that they were evicted from their home at 11 Green Lane. The following year they were living at 1 Radstock Villas, Datchet Road, Slough, in a house with five rooms including the kitchen. This census recorded that both older boys, William and Albert, were working; William as a domestic gardener, and Albert as a labourer. At some point during the next few years the family moved to 14a Ditton Road in Datchet. William’s brother, Albert, had joined the army underage in 1913, perhaps believing that the military offered a better future than farm labouring. Albert was reported missing in May 1915, about the same time that William decided to enlist in Slough. As Private 18737, William trained with the Light Bobs, the Oxfordshire and Buckinghamshire Light Infantry. He was then transferred to the 7th (Service) Battalion of the Royal Munster Fusiliers. In July 1915, the 7th RMF embarked at Liverpool and sailed to Turkey, via Mudros on the Aegean island of Lemnos. They arrived at Suvla Bay, Gallipoli, a month later. In October, they were on the move again, via Mudros, to Salonika, Greece’s second largest city in the north of the country, now known as Thessaloniki. A large Allied expeditionary force established a base at Thessaloniki for operations against pro-German Bulgaria. This culminated in the establishment of the Macedonian Front, also known as the Salonika Front. In October 1915, William was awarded the 1915 Star for service in Greek Macedonia. A later newspaper article revealed that he nearly lost his life in Salonika due to the intense cold and he had also suffered a severe fever which was possibly malaria. In November, 1916, the 7th RMF was disbanded and absorbed by the 6th. William became private 20190 of the 6th (Service) Battalion of the RMF. William would have been at the Salonika front when a large part of the old city was destroyed by the Great Thessaloniki Fire in August 1917, started accidentally by an unattended kitchen fire. The 6th RMF left Salonika in September 1917 for Egypt and served in Palestine. William was said to have had “a wonderful experience” in Jerusalem, perhaps visiting places he had heard about in church or at school. The following spring, 30 April 1918, the 6th left Egypt, sailing from Port Said to Marseilles in France. It was here, on 5 June 1918, that the 6th was disbanded and the troops were transferred to rebuild the 2nd Battalion RMF; and so William found himself in the 2nd RMF. From the end of September, the 50th was engaged in the Battles of the Hindeburg Line, (including The Battle of the St Quentin Canal, The Battle of the Beaurevoir Line, and the Battle of Cambrai 1918), followed by The Pursuit to the Selle near Le Cateau, part of the Final Advance in Picardy. William had only been in the line a short time when he was wounded during the Battle of the Selle (17-25 October). He was killed by a shell as he was being taken back from the Front Line. The war ended less than a month later, on 11 November. 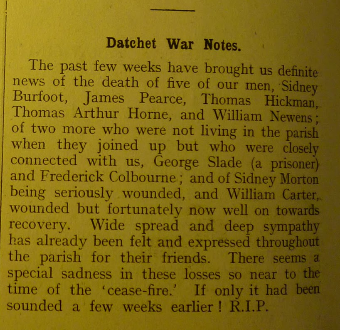 In December 1918, the Datchet Parish Magazine reported the death of William Newens. “The past few weeks have brought us definite news of the death of five of our men,” it wrote. “Wide spread and deep sympathy has already been felt and expressed throughout the parish for their friends. There seems a special sadness in these losses so near to the time of the ‘cease-fire’. If only it had been sounded a few weeks earlier! R.I.P. 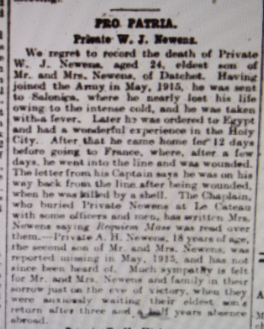 We regret to record the death of Private W J Newens, age 24, eldest son of Mr and Mrs Newens of Datchet. Having joined the Army in May 1915, he was sent to Salonica, where he nearly lost his life owing to the intense cold and he was taken with a fever. Later he was ordered to Egypt and had a wonderful experience in the Holy City. After that he came home for 12 days before going to France, where, after a few days, he went into the line and was wounded. The letter from his Captain says he was on his way back from the line after being wounded when he was killed by a shell. The Chaplain, who buried Private Newens at Le Cateau with some officers and men, has written Mrs Newens saying Requiem Mass was read over them. – Private A H Newens, 18 years of age, the second son of Mr and Mrs Newens was reported missing in May 1915 and has not since been heard of. Much sympathy is felt for Mr and Mrs Newens and family in their sorrow just on the eve of victory when they were anxiously waiting their return after three and a half years service abroad. 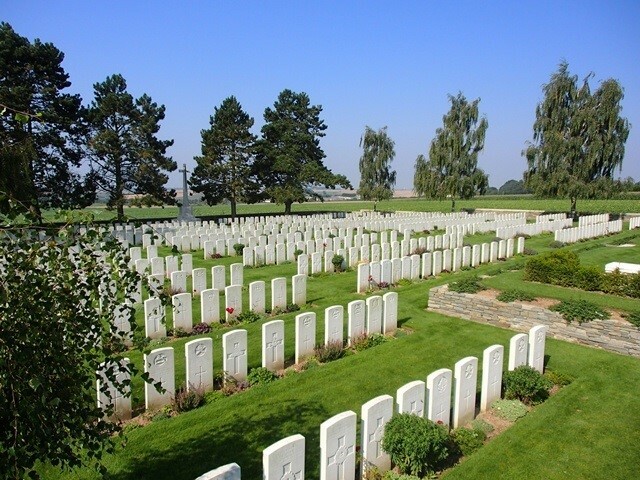 William Newens was buried in the Highland Cemetery at Le Cateau, grave reference plot III.A.14. As the Windsor & Eton Express reported, the Chaplain read Requiem Mass. William’s mother chose the epitaph ‘Rest in the Lord’ for his gravestone. Le Cateau is a small town about 19kms south-east of Cambrai. The Highland Cemetery is the resting place of 560 identified casualties although there are 624 burials. After the Battle of Le Cateau (26 August 1914), the town remained in German hands until the middle of October 1918 (around the time that William was killed.) The original cemetery (Plot III) was built by William’s Division, the 50th (Northumbrian) Division after the fighting of 17 October. The cemetery was greatly enlarged after the Armistice when graves of October and November 1918 were brought in from isolated positions on all sides of Le Cateau. William was awarded the British War Medal and Victory Medal in addition to the 1915 Star he received for service in Greek Macedonia. He and his brother Albert are both commemorated on Datchet’s War Memorial.